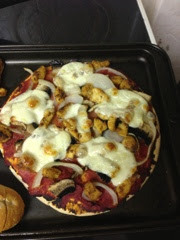 Slimming World Diary: Weigh In, Pizza! .. So yesterday was weigh in day, no point going around the houses to tell you I maintained. 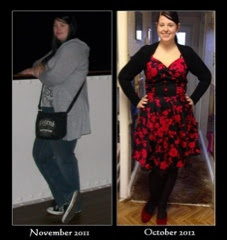 Which is much better than gaining but I was half a pound away from my 2 and a half stone award. It's frustrating but its my own fault, I had too much bread this week, I know this. I have to cut down on it, not to mention them cheeky snacks. Last week my motivation was shot. Sometimes you just get those weeks, the weeks that are harder than others. I needed a boost, some sort of shot of inspiration. Today is a brand new week, and I have my inspiration. I have made before and after pictures for my friends and a couple of others but never for me, I didn't think there would be any difference, but today, with my inspiration gone I thought why not? So here it is, my inspiration to keep going! So the weigh in came and went, and it was time for something to eat, Tuesdays I always say is treat night, I like to have a bit of chocolate or something, but with my maintain I by passed that and went straight for my dinner (another treat). Pizza, garlic bread and chips, now I know what you're thinking, 'one slice of take-away pizza is 25 syns!' But don't worry I had a full plate of these things and it was only 7 syns! 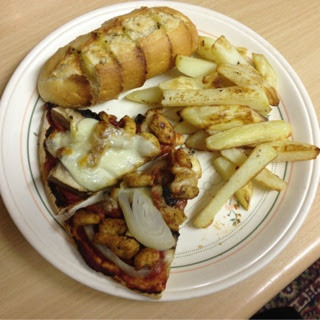 I had a gorgeous homemade chicken pizza, SW chips and petit pan garlic bread. To get this meal to 7 syns I have to use both my Healthy A and B. Also you can't eat the whole pizza, I have a quarter, or if you can have half for 12.5 syns, which still is acceptable. Really easy as well, all takes under 30 mins. To make the pizza spread the tomato puree on the pizza base, add topping of choice and cover with sliced mozzarella. Put in oven at 170c for 10-15 mins. For the garlic bread mix the Flora, garlic and mixed herbs in a bowl. With a knife make slits in the petit pan and spread a little of the garlic butter in each one. 1 tbsp is 1.5 syns so make sure you don't go over. Bake this in the oven with the pizza for 10 mins or until browned on top. To make the chips I spray a small baking tin with Fry Light, add the potatoes and spray Fry Light on top, put in oven at 170c for 20-25 mins, then raise temp to 190c for 10 more mins to brown them a little. Here's how I work it out because I think a few people will be a little dubious. Quarter of the basic pizza base is 5.5 syns. I use my Healthy A for the cheese. My Healthy B for the full Petit Pan. A tbsp of Flora Extra Light is 1.5 syns. All together a healthy option for a take away night and a very satisfied Charlotte!